All available to order today! Finalist at the Business Book Awards 2019 - Best Short Business Book. How to create positive change and outcomes by "shifting" our attitudes. 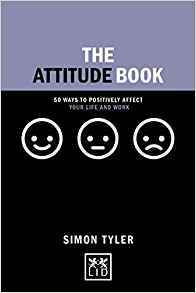 The definition of attitude: an expression of favour or disfavour toward a person, thing or event. As human beings, we often find ourselves locked into certain habits, patterns and behaviours. However, that is not to say we do not have a choice, especially when it comes to our attitude toward people, situations and outcomes. Part of the bestselling Concise Advice series - stylishly presented and easy to understand and apply. Shortlisted for the Short Business Book Award, 2019 Business Book Awards. The best leaders and managers create change. They are able to create a vision, communicate an idea and in particular encourage action from others. What is it about these leaders and managers which makes others want to follow, engage and to act? This compact book contains 50 practical tips and techniques to inspire and provoke you to review your life, change old habits and enhance your life by "keeping it simple". Each tip also contains a lesson or exercise that will challenge consensus thinking, break through barriers and redefine connections through the power of attitude. This is a book that will simplify your life and help you achieve your goals. The secrets to unlocking your ability to create presence, impact and change at work. The term “IMPACT” describes the effect we have on those around us. Having impact expresses the collective impression left by our visual appearance, our presence, the way we connect with others and the lasting effect we have on people when we have left the room. This book provides 50 short but powerful ways to raise your impact level in business. Taken together, it forms a code to enable you to create response in others and to ensure that every encounter (within your company and outside of it) has the potential to bring something to you, whether that be financially, professionally or personally.